From Kenya and Tanzania to Nigeria and Ivory Coast, off-grid African communities are embracing solar energy. Desperate times call for desperate measures. So Tanzania, where 80 percent of the population has no reliable access to electricity, is planning to import biomass as fuel from Ethiopia this year and is building a $2 billion hydropower project threatening the Selous Game Reserve. Meanwhile, several thousand Tanzanians are finding an easier, eco-friendly solution: solar-powered LEDs available through a pay-as-you-go model. Tanzania’s woes aren’t unique. The World Bank says annual outages in sub-Saharan Africa can range from 50 hours to 4,600 hours — at the latter end, that’s more than half a year. So an off-the-grid solution is proving valuable in the region and throughout Africa. From Kenya to Tanzania, Uganda to Rwanda, Nigeria to Ivory Coast and even war-torn Somalia, Africans are embracing solar energy solutions that help them power their homes even without being connected to the grid, on an unparalleled scale. Nairobi-based M-KOPA started the revolution. Launched commercially in 2012, M-KOPA allows low-income families access to solar energy for as little as $1 per month. This is cheaper and more environmental than the alternatives, kerosene or diesel fuel, and offers a metered payment system tracked through their phone SIM cards. The first firm in the world to develop that innovation, M-KOPA now has 600,000 customers across Kenya, Tanzania and Uganda, and is bringing solar power to 500 new homes every day. It has received $162 million in investments since 2014. But the firm is no longer alone. There’s this incredible market opportunity. Uganda-based Fenix, which launched in Africa soon after M-KOPA, has now reached more than 1 million homes. While Uganda remains its biggest market, it is now expanding to other nations. In 2018, Fenix — which has raised $16 million in investments — entered Zambia, and within nine months had converted 30,000 families to solar energy users. Tanzania-based ZOLA Energy — better known by its earlier name, Off Grid Electric — is now expanding into West Africa, starting with Ivory Coast. It has already reached 50,000 homes in Tanzania. ZOLA has raised $239 million. And in Somalia, Guled Wiliq and his locally based company, Power OffGrid, are bringing electricity to far-flung communities in a country with little standing infrastructure after years of civil war. Power OffGrid has so far provided electricity to 1,000 people. International solar energy players are increasingly focusing on African nations too. Dutch startup Lumos entered Nigeria in 2016. It had sold 73,000 units by the end of 2017. In 2018, it entered the Ivory Coast. Its kits include a solar panel, battery, power sockets, LED light bulbs and a mobile phone adapter. BBOXX, which launched in the U.K. in 2010 and has raised $100 million, has over the past two years moved its operational headquarters to Kigali, Rwanda. It distributes its solar kits through agents in 10 African countries and uses remote monitoring technology to improve battery life and users’ experience. And there’s plenty of market space still for more home-grown and international solar energy startups to support the growing demands for electricity on a continent home to several fast-growing economies that are mostly not yet connected to the grid, say experts. The World Bank estimates that the sector will see sales worth $8 billion by 2022. “There’s this incredible market opportunity that’s not being met by the relatively small handful of companies that are operating on the continent,” says Jem Porcaro, senior director for energy access at the United Nations Foundation. 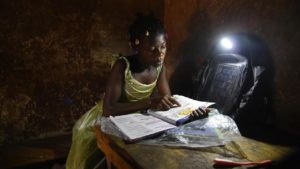 For sure, the spread of solar energy to off-grid communities isn’t unique to Africa. From Quetsol in Guatemala to Simpa Networks in India, a few startups have made similar attempts in parts of Latin America and Asia too. But both the scale of the problem and the spread of nations where solar off-the-grid solutions are being accepted are unique to Africa. The continent had 580 million people who were off-the-grid in 2016 and is expected to be home to 80 percent of the world’s off-the-grid population by 2030, according to the International Energy Agency. Africa-based startups in this sector have received comfortably more than half of the total global investment in this sector, pegged at $922 million by the World Bank. What’s more, the key technology that’s the backbone of the payment model used by most of these low-cost, smart-tech solar energy providers in Africa is also homegrown. Customers use mobile payments, revolutionized by the Nairobi-based M-PESA. “The widespread uptake of mobile money has provided the right environment for off-grid utilities to operate and grow,” says Mansoor Hamayun, CEO and co-founder of BBOXX. The sharp reduction in costs — globally — of solar panels and batteries over the past 15 years has helped make the solar kits these firms offer affordable. For the M-KOPA kit, users need to pay an initial deposit of $35, with 365 payments of 45 cents each after that. They can spread the payment out, with a minimum of $1 a month. Once completed, they own the kit — and can access solar energy free after that. But the spread of off-the-grid solar energy solutions in Africa is also helping the emergence of other local firms that help distribute these kits. PEG-Ghana, for instance, distributes M-KOPA kits in Ghana. These firms are well-placed to take on distribution because they either have local relationships they can leverage to develop sales networks, says Porcaro. Still, the benefits of off-the-grid solar solutions are clear. According to the GoGLA, the global association for the off-grid solar energy industry, 58 percent of households connected to off-grid tech undertake more economic activities because of their solar home system, while 36 percent of households generate additional income once they connect to off-grid tech. And there’s consensus that there will only be expansion in this energy market, as the off-grid consumer becomes increasingly commercially viable, creditworthy and loyal. “It is already clear,” says Moore.